In 2006 Kearney retired and returned to Australia to take up a role as assistant coach at his old club, the Melbourne Storm, under Craig Bellamy. In 2008 Kearney was appointed as the New Zealand Kiwis' head coach on a two-year contract. Kearney (with assistant Wayne Bennett) coached the Kiwis to their first World Cup series win. On 22 November 2008, they defeated Australia 34–20 in the final, at Suncorp Stadium in Brisbane. Following this achievement, he was made an Officer of the New Zealand Order of Merit in the Queen's Birthday honours list. For the 2010 Anzac Test, Kearney coached New Zealand in their loss against Australia. In the 2010 post-season Kearney was announced as Daniel Anderson's replacement as head coach of the Parramatta Eels for three years beginning in 2011. Shortly after that, he took the Kiwis to victory in the 2010 Four Nations final against Australia. In 2011 he failed to coach the Parramatta NRL team to any success, with the Eels achieving just 6 wins and 1 draw in 24 matches, and only just missing out on the wooden spoon when they beat the Gold Coast Titans in the last game of the regular season. Things didn't get any better for Kearney in the 2012 NRL season. 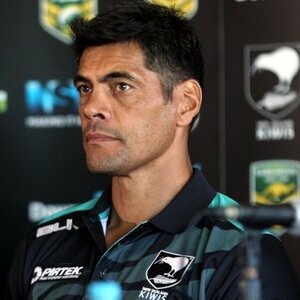 With the Eels struggling in last place on the NRL ladder after 16 rounds, Melbourne Storm's inaugural coach, and two time premiership winning coach Chris Anderson was appointed as a mentor to Stephen Kearney to help him turn the club's fortunes around. However this did not eventuate as Kearney was eventually forced to resign only three rounds later on 20 July, after achieving only 3 wins from 19 matches in the season. He left the Eels with just 10 wins from 42 matches, for a modest winning percentage of 24 percent. 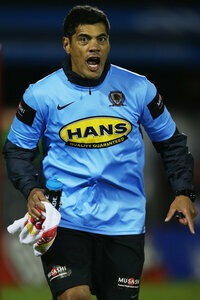 In October 2012 Kearney signed 2 years as Brisbane Broncos assistant coach from 2013. In November 2014, Kearney guided New Zealand to their second Four Nations championship, defeating Australia 22-18 in the final. In March 2015, Kearney signed a new deal to remain as coach of the Kiwis until the conclusion of the 2017 Rugby League World Cup. At the end of 2015, his 23 test wins as coach and five wins over Australia is the most out of any that has coached New Zealand in the past. On 12 September 2016, Kearney stepped down from his role as coach of New Zealand after accepting to return to head coaching in the NRL as coach of the New Zealand Warriors on a three-year deal.